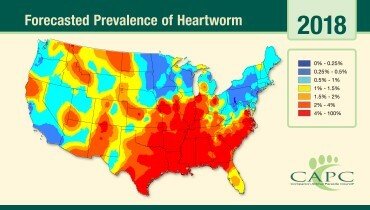 For the fourth year in a row, cases of heartworm infections are forecasted to be above normal across virtually the entire United States. Unfortunately, 2017’s above normal forecast panned out. This increase was partially attributed to the hot and wet weather that occurred in 2016, (mosquitoes like these conditions), and in 2017 the weather was again hot and wet. Moreover, infected dogs act as “reservoirs of infection”, increasing the number of infected mosquitoes and ultimately spreading the parasite to other dogs. The Companion Animal Parasite Council (CAPC) is concerned with this annual increase in numbers of cases. Nationally, prevalence rates have risen each of the last five years and are now up 20% from 2013 levels. In addition to concerns related to heartworm, there is an increasing number of dogs being detected with infections with the bacteria that causes Lyme disease. Given this, it is natural that our national forecasts voice concern for many areas of the country. Overall, CAPC is forecasting above average activity nationwide. 1. The Lower Mississippi Valley, an area where heartworm is rampant, is again forecasted to be more active than normal in 2018. 2. Locations in the Northern tier states --- from Washington State to Vermont --- are forecasted to see more cases in 2018. 3. North and South Carolina coastal areas: you are also predicted to see above normal activity. 4. The Pacific Coast states west of the Sierras are expected to see above normal prevalence. 5. Congratulations Alpena, Michigan: you are virtually the only area in the country forecasted to see below normal activity in 2018. The increase in heartworm activity supports CAPC’s recommendation that all dogs be given heartworm preventatives year-round, and tested annually for both heartworm antigens and microfilariae. A serious and potentially fatal condition, heartworm disease has been diagnosed in all 50 states of the country. It only takes a single mosquito bite for pets to become infected with heartworm larvae. In dogs, the larvae mature into adult worms in the heart and nearby blood vessels, often leading to heart and lung failure. Signs may include coughing, trouble breathing, and exercise intolerance, although some dogs may show no signs at all. Cats can get heartworm disease too. While cats are less likely to develop large numbers of adult worms, immature heartworms can damage the lungs, leading to coughing, asthma-like signs, or vomiting. Even indoor cats are at risk — studies show that up to 30% of cats diagnosed with heartworm disease were described as strictly indoor. Should your pet be on year-round heartworm preventive, even during the winter months? The answer is yes. Mosquito numbers are tied closely to heat and humidity. An early spring or warm, wet fall can cause mosquitoes to emerge early or be active later in the season. Major weather events, such as Hurricanes Irma, Harvey, and Maria, can also cause extensive changes in mosquito prevalence. The single most effective way to avoid timing mistakes with heartworm preventive is to keep dogs and cats on medication year-round and have your dog tested at least once a year. Your veterinarian can recommend an effective preventive that’s right for your pet. CAPC recommends that all dogs be tested annually for both heartworm antigens and microfilariae, even if they are on year-round preventives. Cats should be tested for the presence of heartworm antigen and antibody before starting them on preventive. 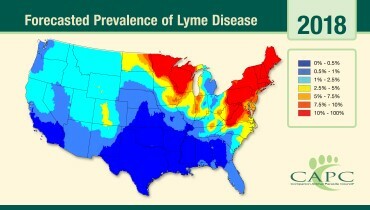 Nationwide, Lyme disease continues to expand beyond recognized endemic regions. Pet owners living or traveling to areas endemic for Lyme disease (Northeastern and the upper Midwestern US), or those areas on the edges of Lyme disease endemic areas (The Dakotas, Iowa, Illinois, Ohio, Kentucky, Tennessee, North Carolina) should talk to their veterinarian about testing and protecting their dogs against this disease that is a threat to both animals and their owners. 1. Western Pennsylvania, Eastern Ohio, West Virginia, and the Appalachian region in Virginia: prepare for an active year. 2. Northwestern Wisconsin and Northern Minnesota are expected to see much higher than normal activity in 2018. 3. Washington DC to Philadelphia, PA and eastward (including the Delmarva area) and the Boston/Cape Cod area: congratulations, you are expected to see a little relief this year. Lyme disease is a bacterial infection transmitted through the bite of an infected black-legged tick (including eastern and western black-legged ticks). Infected dogs may show signs such as shifting-leg lameness, fever, lethargy and loss of appetite, although the majority of infected dogs show no signs at all. Lyme disease can lead to systemic complications including renal disease. People and other pets in your household can’t catch Lyme disease directly from an infected dog. However, infected dogs do indicate that there are infected ticks in the area that may transmit the infection to other household members. Year-round tick control and vaccination can help safeguard your dog. Lyme disease is just one of numerous diseases associated with ticks. Within any geographic area, there are likely several different species of ticks and each tick can harbor more than one disease-causing agent. Some species of ticks can also be active during the winter. While it helps to limit your dog’s exposure to ticks by avoiding tall grass and wooded areas, this approach may not always be feasible. That’s why CAPC recommends year-round tick control and regular screening tests for dogs. Also, don’t forget that cats can get ticks and there are important tick-borne pathogens of cats (e.g., cytauxzoonosis). Keep your pets and family safe from tick-borne disease. Talk to your veterinarian about Lyme disease prevention, including year-round use of tick preventive and vaccination. Because parasite infections are dynamic and ever changing, CAPC recommends all dogs be tested for Lyme disease, Anaplasmosis and Ehrlichiosis on an annual basis. Exposure to one or more indicates that your pets have been exposed to ticks and enhanced prevention is necessary. How are the CAPC Forecast maps constructed? Numerous factors are analyzed, including the number of positive tests for the bacterial infection and the influence of weather patterns, vegetation types, and human population density. Leading parasitologists work in collaboration with a team of statisticians to identify regions of the country that may experience higher parasite numbers in the months ahead. While these forecasts predict the potential risk of a dog testing positive, they do not necessarily reflect clinical disease. The best source of information on parasitic disease is your local veterinarian: they are your local experts and the best provider of healthcare information for your pets. To help you identify the risk for parasite infection in your geographic area, CAPC provides Parasite Prevalence Maps down to the county level. The maps report the number of dogs testing positive for infection in your area, as well as in other regions where you may travel with your pet. Parasites that affect pets and people are dynamic and ever changing, and CAPC is your trusted resource for accurate, timely information.